Watching Ellar Coltrane grow is the subject of Richard Linklater’s Boyhood. “Twelve Years in the Making!” Sounds more like a tagline from a Hollywood biblical epic, not Boyhood, the latest, commendably ambitious film from director Richard Linklater. I know what you’re thinking. 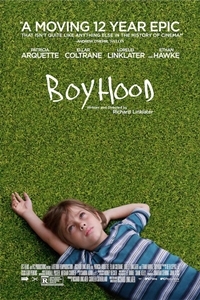 Would it really have made that much difference had Boyhood been filmed over a period of three months with a range of actors playing the leads at various stages of their lives as opposed to a 12-year shoot that affords its cast the relatively unheard of luxury of literally aging before our eyes? I say relatively because two similar cinematic experiments immediately come to mind: Francois Truffaut’s 20-year, 41/5 film Antoine Doinel cycle (The 400 Blows, Stolen Kisses, etc.) starring Jean-Pierre Leaud as the director’s alter ego, and Michael Apted’s continuing series of Up documentaries, which, starting at age seven, began chronicling its subjects’ growth in seven-year increments. Mason (Ellar Coltrane) and Samantha (Lorelei Linklater) are the product of good people (Patricia Arquette and Ethan Hawke) who couldn’t make their love work. With dad temporarily out of the picture, we begin to follow Mason on his journey through age 5 to 18, passing from family to family in one Texas town or another. Known only as “Mom,” Arquette could qualify for parent of the year were it not for the bad romantic choices she made. Coltrane is the donut hole in a box containing an otherwise delectable assortment of performances. Once he gets caught using his teacher’s pencil sharpener to turn rocks into arrowheads, not much initiative is provided and his soft-sell reactions to events around him take on even less command. It’s doubtful that Linklater had a finished shooting script tucked under his arm the first day he called “Action!” Much of the film’s appeal stems from its structured commitment to chronicling growth without relying on improvisation as a crutch. It would have been impossible for Linklater to divine what events would unfold during the great shoot and the film stumbles only in its clumsy attempt to depict a shift in political tone. While Ethan Hawke is out stumping for Obama he instructs his son to pull a McCain poster from a neighbor’s lawn. Years later and a second marriage lands him squarely in Bush territory made blatantly obvious by a birthday party where Mason’s new set of grandparents gift the 16-year-old with a Bible and a gun. Linklater doesn’t take the easy way out by simply compiling an ironic checklist of technological advancements or padding the score with wall-to-wall recognizable tunes. And, blessedly, there is not a trace of sentimentality. The dialog is refreshingly honest; for a change the kids counter their parents exhortatory counsel with equally invasive questions of their own. Linklater’s casual hand at storytelling, dealing out reel after reel of naggingly forthright enlightenment, turns this simple tale of a mother trying to do her best into something worth every second of the time it took to produce. July 22, 2014 @ 10:24 p.m.
July 31, 2014 @ 8:43 p.m.